Above is a recently completed Mr Punch Marionette made purely as a personal project. The construction and control are based on the design for 'a simple carved puppet' in 'Plate V' of Waldo Lanchester's book "Hand Puppets & String Puppets." Waldo's design was for a 12-14 inch figure, but the enlarged head and large hat on this figure take it up to about 16 inches tall. 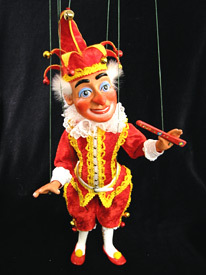 It is strung on a horizontal control, also taken from Waldo's book, the control being similar, but slightly smaller than the control later used by Pelham Puppets. 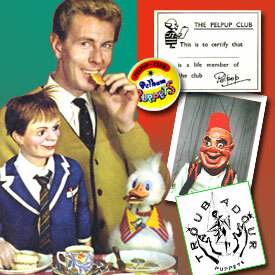 Recent updates to the Archives Section of the site, include Ray Alan's Tich & Quackers, Pelham Puppets & The Pelpup Club, The Marionettes of Harry Tozer and Elizabeth Coleman's Troubadour Puppets. The Archives section of the website now has a newly-designed and more colourful Home Page and an Introduction Page. The Archives have also been updated with a lengthy item on the work of John Dudley with the Dudley Marionettes and Dudley Telepuppets (the 'Telepuppets' referred only to John Dudley's glove puppet work and the term was coined long before the 'Telegoons' made an appearance). Many photos are included with some fascinating variety theatre posters. There are sufficient pictures from John for another gallery at some time in the future. Additionally, an item on Jan & Vlasta Dalibor of 'Pinky & Perky' fame has been added. 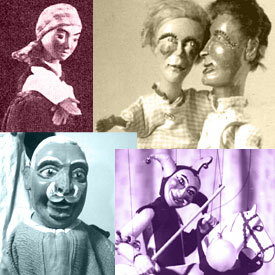 The most recent updates to the site have been in the Archives Section, including articles and galleries on The Rozella Troupe, Len Walker's Merryman Marionettes, Walter Wilkinson, the Hertfordshire Puppeteers, W A Call's Cambria Puppets and Wallace Peat's Wessex Puppets. 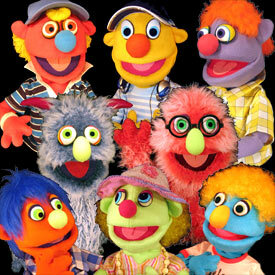 The above figures are part of a set of 15 Hand & Rod Puppets made for a Midlands Educational Arts Project. 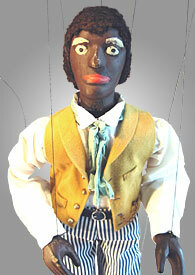 We have recently carried out costume restoration on the above Victorian Marionette (Billy Big Boots) by Harry Wilding. The figure was on display for two seasons at Staffordshire County Museum, Shugborough and has now transferred to the Museum of Cannock Chase.